Posted in Diet & Nutrition on August 25, 2013. Last modified on March 28, 2019. Read disclaimer. Many health experts have long emphasized the heart and brain health benefits of omega-3 essential fatty acids (EFAs). Some research even suggests that EFAs may help us to battle depression and diabetes. Now, there's increasing evidence that these fatty acids may even help us to live longer. A recent study published in the Annals of Internal Medicine compared people who had a regular daily supply of omega-3 fatty acids with healthy older adults who did not take a daily omega-3 supplement. The results determined that those who didn't take omega supplements died at a younger age, especially from coronary heart disease (CHD). Study researchers analyzed 2,692 U.S. adults, from ages 69-79, without any known CHD, stroke or heart failure issues. Fatty acid levels and cardiovascular risk factors were measured in the subjects from 1992 until 2008. Results showed that during this time period, 1,625 deaths (including 570 cardiovascular deaths), 359 fatal and 371 nonfatal CHD events, and 130 fatal and 276 nonfatal strokes occurred amongst the high risk group. Those who supplemented regularly with omega-3 fatty acids lived longer and suffered from far fewer cardiovascular issues. Individuals who had higher omega-3 levels lived an average of 2.22 more years after age 65 than did those who didn't supplement with omega-3s. While the study suggests that eating more may be beneficial, the greatest benefit appears when you go "from zero to some." Concerned about mercury, PCBs, pesticides and other toxins in seafood? Learn which fish are safe to eat and which should we avoid. The results from this study confirm that essential fatty acids are important to wellness. Unfortunately, our bodies cannot make EFAs so we must get them from our diet or supplement. The healthier our fat intake is, the healthier our body will stay. So, eat healthy fats, supplement when necessary and reject unhealthy fats like trans-fats for a long, healthy life. Seafood: Halibut, Herring, Pacific mackerel, Salmon, Sardines, Trout, Anchovies. Even canned Salmon and Tuna are good. 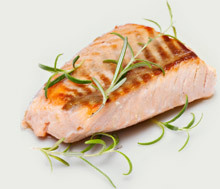 Adults should eat at least 8 ounces of these oily types of fish per week. Children need less. Seeds and Nuts: Walnuts, Flaxseed, Peanut butter. Foods that have been enriched with Omega-3: Look for "Omega-3 fortified" Eggs, Milk, Juice, Breads, Cereals.